Blog Oceanfronts for North Carolina — how to know the income? Hi, I’m Jay Seville the owner of Wilmington-real-estate.com that’s Wilmington dash real dash estate.com and DBA doing business as Ocean Views Real Estate incorporated in Southeast North Carolina. 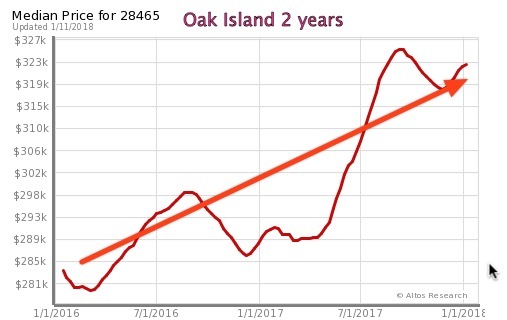 I work a ton with Oak Island Oceanfront vacation rentals down here that’s where people from the Northeast or Charlotte or Raleigh Triangle or Ohio they buy a beach property, a condo or a single-family house, duplex, second row. And mostly they rent it out as a vacation rental then it largely pays for itself over time. They get a tax deduction and they get appreciation because we’re in a – a steeply appreciating market right now. And they use it themselves a couple times a year. And it’s called a vacation rental, usually they’re financed as second homes and then wink wink they’re actually rented out almost all the time. So one of the challenges with this is knowing what are the numbers. What are the numbers? In other words what are all the little fees? There’s a ton of fees for these vacation rentals and at first glance you see a gross and you’re like, “Wow 40,000 gross, that’s awesome, that’s going to pay all my bills plus a whole bunch.” And then you run the numbers more in-depth on all the little fees and management costs and you end up at a much lower profit margin which makes it not nearly as exciting. Although it can still be, you know, a good investment property etcetera and I’m going to do other videos on that specific subject. But for now I’m going to focus on property management costs. And that is how much – how – how effective are these property managers? Because usually they’re 18 to 20% and theoretically they are supposed to take care of everything and make it so easy, you just buy it and walk away from it and they take it over, and they rent it out better than you could. What I’m finding though is, is actually in lots of cases these homes are very undervalued. Meaning a home is grossing $16,000 a year some one bedroom condo on the beach. But it could be grossing $22,000 a year, it’s undervalued it’s not being rented out at the appropriate rate. Or sometimes I see the big examples I see a – a $600,000 home that has rentals of 35,000. And I’m like well if we – if we look at the comps actually other homes right around here are grossing 55,000. The owner is leaving 20 grand on the table they don’t even know it probably.